What Day Of The Week Is May 4? 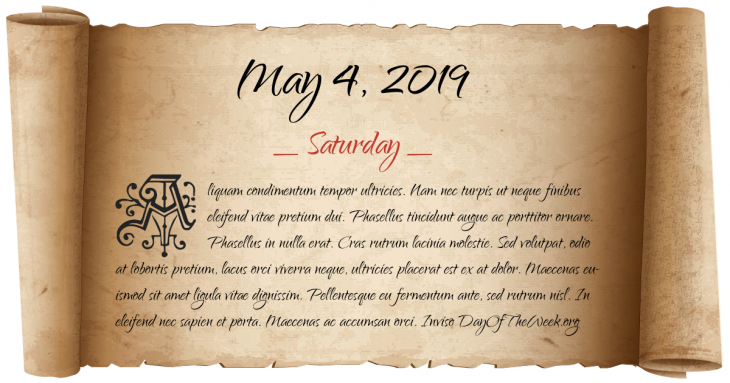 May 4, 2019 is the 124th day of the year 2019 in the Gregorian calendar. There are 241 days remaining until the end of the year. The day of the week is Saturday. American Civil War: The Battle of Chancellorsville ends with a Union retreat. Italy occupies the Greek island of Rhodes. In San Francisco Bay, U.S. Marines from the nearby Treasure Island Naval Base stop a two-day riot at Alcatraz federal prison. Five people are killed in the riot. The 1st Grammy Awards are held. Who were born on May 4?